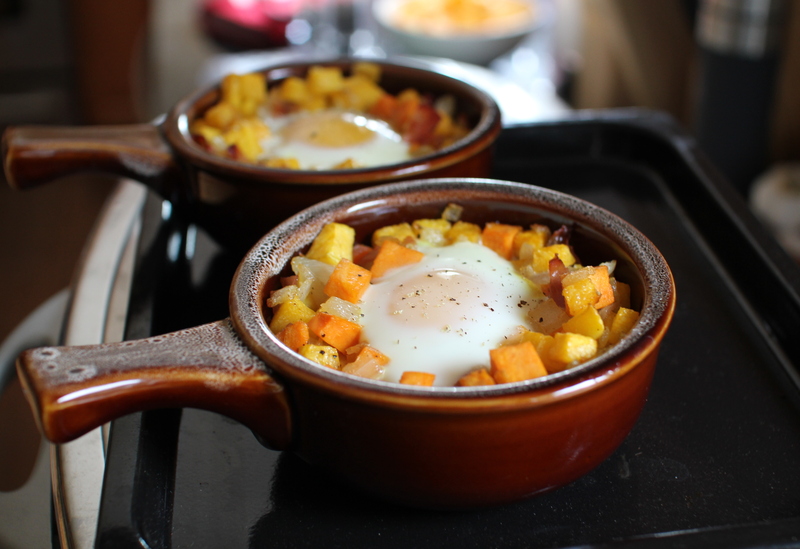 Sweet Potato + Butternut Squash Hash [Recipe] – Cin Cin, Let's Eat! What to do on a rainy Sunday morning? Stay in and cook some brunch, of course! The perfect brunch, for me, consists of over-easy eggs, bacon or sausages, and some potato hash. I, however, didn’t have any potatoes on hand. What I did find in the kitchen were a couple of sweet potatoes and a butternut squash (the squash is from my garden, from last year’s harvest. Amazing how these things last! It’s still so juicy and sweet.) Feeling inspired, I decided to substitute the potatoes with these two vegetables. The result was a light yet filling dish, completed with a baked egg on top. The sweetness from the vegetables, saltiness from the bacon, and the slight kick from the cayenne and spice…perfect combination of flavors. And I didn’t fall into a food coma for the rest of the day as I would with the greasy potato hash. Perfect meal for a rainy Sunday morning! Add bacon to skillet. Cook for another 5 minutes. Let the fat render from the bacon, stir occasionally. Add salt and pepper, cumin, nutmeg, cayenne pepper. Be sure to taste to adjust to your liking. If you are not using a skillet that can go in the oven, transfer the vegetables into a baking dish or souffle ramekins. Make some wells/holes and crack an egg in each hole. Pop them in a 350F oven/toaster oven. Bake until the egg whites set. (check after 10 minutes.) You don’t want to over bake them or the egg whites will turn rubbery. Serve with a splash of your favorite hot sauce. Try out different variations of this recipe! For example, use Italian sausage (no casing), and season it with oregano, thyme, or sage. Play around with the seasoning and fixings, you’ll turn one simple dish into at least 5 different tasty variations. 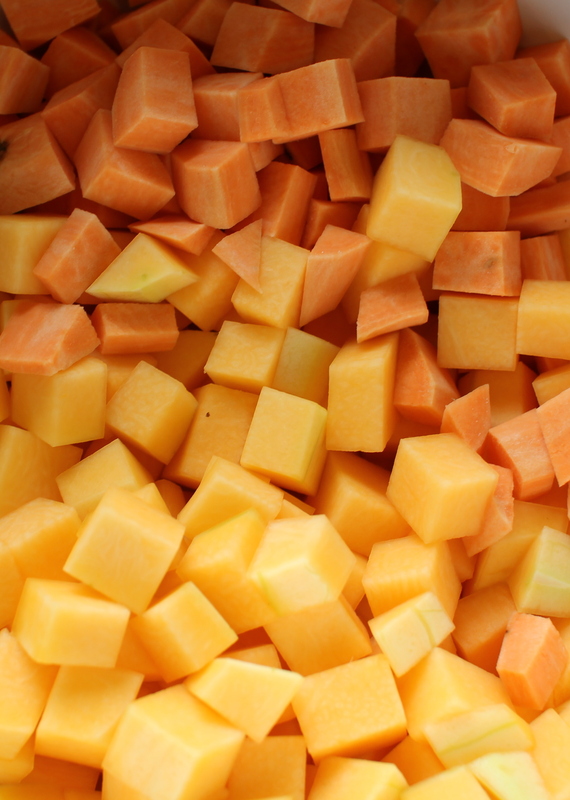 If you want that richness of potato hash, saute the vegetables with the addition of 1 tbsp of butter. This looks great. I like the idea of using chorizo or pancetta. Ok, really it all sounds good. Nice photos too. i swear, i need to get more different types of cooking dishes. i can see how each one can be useful! this looks delish!